The VXX team displaces five international S-92 partners: Mitsubishi Heavy Industries (cabin and aft sponsons); Jingdezhen Helicopter Group China (vertical tail fin and stabilizer); Gamesa of Spain (main rotor pylon, engine nacelles, transition section, and cabin interiors); Embraer of Brazil (sponson structures, fuel system and landing gear); and AIDC of the Republic of China (cockpit structures). Rockwell Collins and General Electric Aircraft Engines work on both the S-92 and VXX. "This helicopter is completely American," said Sikorsky President Steve Finger at a press briefing last month. "What does this mean? It means we don’t have to discuss whether the aircraft for the U.S. president is 25% American, or 50% American or 75% American, because it is all American." This is a clear dig at Sikorsky’s competitor, AgustaWestland-Bell-Lockheed Martin, which is offering the US101. A variant of the British–Italian EH101, the US101 has "at least 65% American content," said Lockheed Martin Vice President Steve Ramsey. Ramsey said, though, that helicopter capabilities and performance, not political and nationalist concerns, will decide the VXX competition. "We believe the question is not what is the right domestic content, but what will provide the best capability for the President." The request for proposals issued December 15 gives no indication that the Pentagon would prefer an American helicopter and Sikorsky officials stopped short of saying explicitly that politics ought to trump technology. "It is clear that the VH-92 offers the best performance and technical capability," Finger said. And, he added, only an all-American contracting team can ensure the safety and security of the President. "With the VH-92 we can be confident that our President will never be put in a position of worrying whether parts or information were compromised outside of the United States," Finger said. Ramsey denied that AgustaWestland poses a security risk to the President and VXX. "There’s a very detailed security regime that has to be followed, and for certain aspects of the program, you must be a U.S. citizen, but not every single person who works on the program is required to be an American citizen," he said. "We’re confident that our proposal will fully comply with the myriad security requirements." "Politics pushes both ways on this procurement," said Loren Thompson, of the Lexington Institute in Arlington, Virginia. "This could be a rare opportunity [for the United States] to express appreciation to two important allies—Britain and Italy." The civil helicopter industry is starting to show strong growth throughout the Middle East, according to exhibitors at the 2004 Dubai Air Show. Particular strength is in the "VVIP" and heads of state market, according to Ron Jones, business group director for AgustaWestland. These high-level executives are also demanding a higher level of technology for their helicopters in keeping with new technology found in their corporate fixed-wing aircraft, he said. As a result, the competition for a new U.S. presidential helicopter is being closely watched, with the Middle Eastern operators very interested in what will be going into the winning helicopter. Both Sikorsky and AgustaWestland were heavily touting their S-92 and EH-101, respectively, at the show. 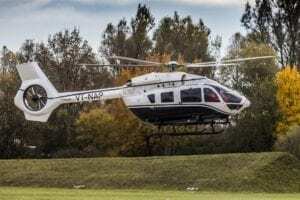 Eurocopter was also strongly promoting its AS 365, EC 155 and new generation Super Puma EC 225 for the developing VIP market. Other emerging helicopter markets in the Middle East are emergency medical services (EMS) and oil and gas exploration, to include pipeline patrol. A limited number of EMS specialists scattered throughout the region is causing that market to grow, with civilian operators taking over what had been a police or military role. Generally this will lead to a requirement for more light to medium helicopters, although the ability to handle mass casualties will be a consideration, Jones said. Alan Parsons, vice president, marketing for Hawker Pacific noted that there is a lot of consolidation and expansion of oil fields throughout the region. "In the past, companies shared helicopters. Now they are moving into their own." He predicted a steady growth for medium-sized helicopters such as the Bell 412 or upcoming AB139 for the oil and gas industry. Hawker Pacific represents Bell Helicopter throughout the UAE, Oman, Qatar and Bahrain. Xavier Hay, vice president, Middle East/Africa for Eurocopter, said that the light observation helicopter market is poised for an increase in homeland security and police requirements. He noted that the police in the United Arab Emirates already have the Bk105 while the Kuwaiti police operate the EC135. In a move reminiscent of Lockheed’s famous Skunk Works, Bell Helicopter has formed Bell XWORX to be responsible "for the rapid development and prototyping of new vertical solutions for emerging and changing requirements," said Bell CEO Mike Redenbaugh. Bell XWORX "will bring together several organizations within Bell that have been developing new ideas and products for many years. Now all of them will be contained in one organization." Bell XWORX is located at Bell’s facility in Arlington, Texas. 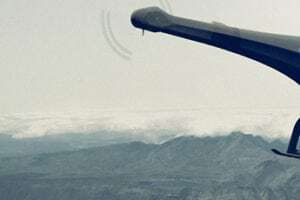 It is already working on projects such as a full-scale flying prototype of the HV-911 Eagle Eye unmanned aerial vehicle (above) and the quad-tilt-rotor aircraft. A major function of the XWORX will be "rapid prototyping for new concepts," taking projects off the drawing board to see if they work. XWORX is also being used for retro work—fully restoring the original XV-3 convertiplane, the earliest version of the tilt-rotor aircraft, which was first flown on Aug. 11,1955. Enstrom Helicopter has received FAA certification of a pop-out float system to be offered as an option on its 480B turbine-powered helicopters. William Taylor, director of engineering for Enstrom, noted that certification of the floats "adds one more option to our broad range of uses for the 480B" and that they "will add versatility to operations by increasing safety in over-water flights." Taylor said that the floats have little effect on performance and can be installed or removed "with minimal effort." Operators of MD Helicopters aircraft can save up to $30,000 under a new program created by the company and U.S. Aircraft Insurance Group (USAIG). Any MD operator who qualifies for USAIG’s "Safety Buck" program and participates for one year can earn up to $30,000 in "Safety Bucks." Those can then be used to purchase factory-authorized pilot or maintenance training from MD. USAIG Senior VP Mike Kriebel said the Safety Buck program has been in effect since 1997 and that 90 operators have received nearly $20 million in training. Henk Schaeken, chairman and CEO of MD, said that his company’s enrollment in the program "is a win-win program for our customers and the industry as a whole. We’re promoting good safety and training habits while providing a tangible benefit to operators." He noted that studies by both MD and USAIG have shown that pilots who complete factory recurrent training programs have better safety records than those who don’t. The Niagara County, New York, Sheriff’s Department Air Support Unit is back in the helicopter business after a two-year hiatus, thanks to the war on terrorism. The sheriff’s helicopter division, headed by Sgt. Ronald Steen, was grounded two years ago due to budgetary constraints. However, a $35,000 infusion of funds from the Department of Homeland Security has allowed the program to get back in the air. 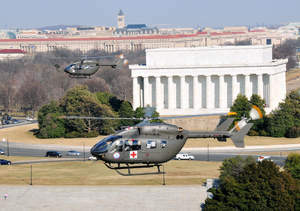 The Department has three OH-58Cs, obtained in 1996 under the U.S. Army’s North Star Program to be used for drug interdiction. Currently only one will be put back into service, pending additional funds. 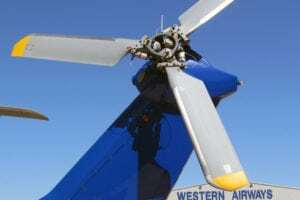 The initial funding allowed the helicopter to be taken to Genesee Co. Airport in Batavia, where it was inspected and had minor repairs done by Boshart Enterprises. That company does repair and maintenance work on U.S. Border Patrol and New York State Police helicopters in the western part of the state. Steen said that the second helicopter could be brought back under an "as needed" basis. He noted that a new gambling casino has recently been opened on the New York side of Niagara Falls "which is bringing a lot of money into the area." This could not only help pay for the necessary inspection and repairs, but could justify the use of the second helicopter. The helicopters are primarily used for basic law enforcement, particularly searching the county’s rural areas for marijuana fields. However, Steen said that the helicopters are also available to help the Border Patrol check out potential terrorist targets in the area. 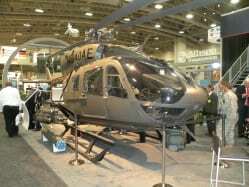 U.S. Army helicopters continue to be shot down in Iraq—two such incidents in one week early last month killed 10 U.S. servicemen—but the Army is successfully adapting its tactics, techniques and procedures to minimize the risk to pilots and soldiers, said officials at an annual aviation symposium last month. "We’ve varied our routes, varied our altitudes. We very seldom go into hover operations. We’re using darkness to our advantage, because we definitely have a lot greater capability at nighttime. We’re constantly moving," said Brigadier General E.J. Sinclair, commanding general of the Army Aviation Center in Ft. Rucker, Alabama. "The key is making sure we’re not predictable." Army aviation in Iraq had become all too predictable after the end of major combat operations in May. In fact, some aircrews grew so complacent that they didn’t utilize their aircraft survivability equipment (ASE) because they were having problems with damaged ASE gear, Sinclair said. "The enemy had gone to ground and we established flight corridors," he explained. "They knew what airfields we were at. There was no question about where our aircraft were located, so they could position around them. Because of our airspace management, we had specific checkpoints you flew over to get into those [airfields]. Well, we’ve changed that, and I think it’s made us a lot more successful." Lessons learned in Iraq are rapidly being incorporated into pilot training, Sinclair said. Indeed, Ft. Irwin’s National Training Center now emphasizes fighting against a guerilla insurgency in an urban desert environment. Ditto simulation training and flight instruction at Ft. Rucker. Moreover, all Apache pilots are now being qualified with night-vision goggles (NVG), because bullets and tracers are visible to pilots with NVGs. Apache pilots previously had relied on a night-vision system, through which bullets and tracers are not visible. Black Hawk and Chinook pilots have always been NVG-qualified, Sinclair said. In a surprise move, the world’s largest military contractor was shut out from bidding for the $3-billion (Canadian) contract to replace Canada’s aging Sea King helicopters. Lockheed Martin Canada, a subsidiary of U.S. military giant Lockheed Martin, found it was out of the running, a few days after Canada’s new prime minister took office. The Liberal government of Paul Martin said that Lockheed Martin failed to measure up in the pre-qualification phase and, therefore, could not bid on the final contract. 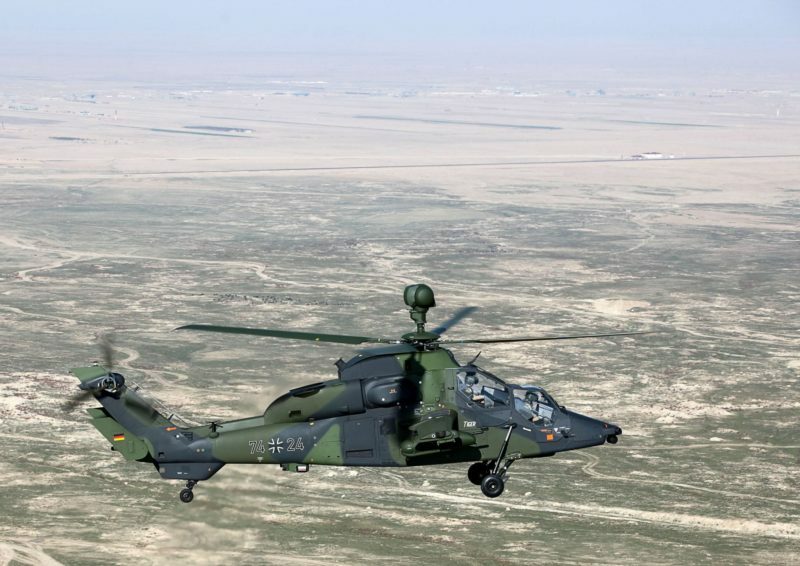 In its joint bid with NH Industries of France and Thales Systems Canada, the company had proposed the NH-90. Lockheed Martin is considering an appeal to the Canadian International Trade Tribunal or legal action in Canada’s Federal Court. The replacement of the deteriorating 40-year-old Sea Kings have been an ongoing political controversy for the last decade. In his first day in power in 1993, former Prime Minister Jean Chretien cancelled the C$5.8-billion contract for the EH-101 helicopter, awarded by the previous Progressive Conservative government of Brian Mulroney. The Sea Kings, known as "hangar queens" because they require 30 hrs of maintenance for every flying hour, are used for search-and-rescue, anti-submarine patrols, surveillance and shipborne duties. The one assigned to patrol the Arabian Sea as part of Operation Apollo, the U.S.-led anti-terrorism operation, sat idle for 42 of its scheduled missions—a 55% availability rate during the six-month assignment—due to mechanical problems. Defense Minister David Pratt reaffirmed the Liberal government’s commitment to new maritime helicopters by formally issuing a request for tenders four days after taking office. The two remaining bidders for the fleet of 28 aircraft are Sikorsky with its S-92 and Team Cormorant, which has proposed the EH-101. They have until April 2004 to submit their bids. The contract is to be awarded next summer, with delivery of the first new helicopter targeted for 2008. The Australian Department of Defence has eliminated AgustaWestland from its Air 9000 program aimed at replacing and upgrading its S-70 (UH-60) Black Hawks and rationalizing its entire helicopter fleet (R&W, November 2003, page 14). 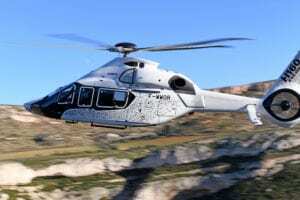 AgustaWestland had submitted its EH-101 for the competition. The remaining competitors are Sikorsky, which recently purchased Helitech, a Brisbane-based defense helicopter maintenance center, and Eurocopter.